Networked Saving makes it possible for a working family to save for a down payment on a home—while paying the same rent that they’ve already been paying. This turns permanent renters into permanent homeowners. And that changes neighborhoods, communities and lives—for generations to come. In 2016, the Networked Savings Program was recognized as a Classy Award Finalists and named one of the World’s 100 most innovative non-profit programs (read more). 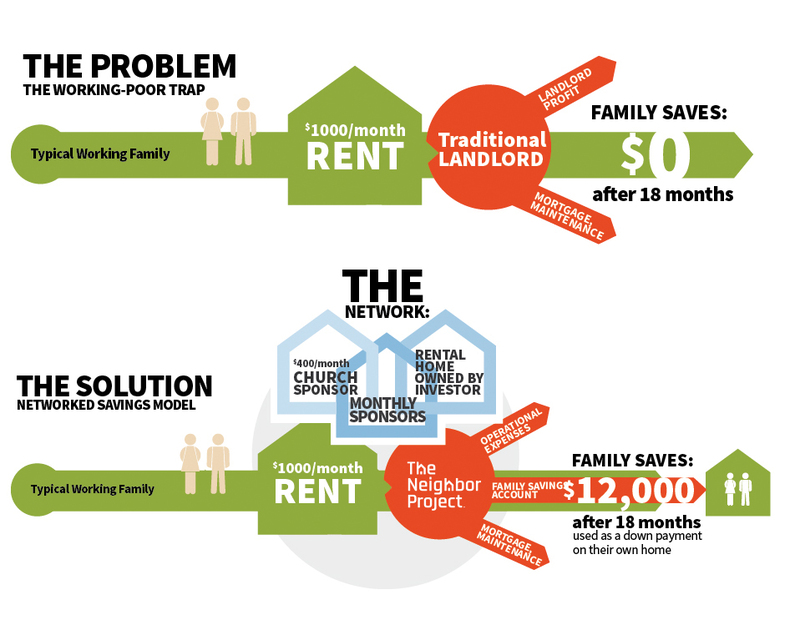 Program participants live at a Networked Saving property and pay the same rent they would otherwise pay (typically between $800 and $1200 a month for a family apartment in a duplex). The program lasts 18–24 months. For the first 3-6 months of the program, 100% of your rent goes to TNP. You’ll complete a full credit assessment, register for personal finance classes and set up a personal savings account. For 6–12 months, 50% of your rent goes to TNP and 50% goes into a savings account. You’ll take personal finance classes and hone your credit, will be paired with a maintenance partner to learn homeowner skills and attend customized workshops. For 6–9 months, 100% of your rent goes into a savings account. You’ll finish finance classes, get realtor referrals and start looking for a home of your own. In every case, Participants exit the program with a full year’s rent in savings (typically $10,000–$12,000), ready to purchase their first home. In 18–24 months, a family’s life trajectory can change forever. Church Sponsors and Volunteers are the key support network of our 18-24 month program. Your church or small group can help expand our program to help more families by sponsoring a duplex for $400 a month—but it takes more than money. Sponsors provide volunteers to do maintenance and rehab projects on our savings unit properties, provide learning partnerships and build life-changing friendships with participating families. Without churches and volunteers, our program fails. With it, the future is rewritten. Monthly Sponsors and One-time donors provide essential extra income, helping cover housing costs at a residence so participating families can save. Learn more. There are other ways to invest in The Neighbor Project as well. Learn more on our Volunteer page. Families interested in applying to participate in this program must be employed full-time for a full year, looking to be a first-time home-buyer and be between 30–80% of Area Median Income). There is a growing economic divide in our communities which leading financial institutions have shown creates a drag on overall economic growth. One driving force for this economic divide is asset-poverty (read more about assets here). A family can have a steady income, but have little to no assets. Assets provide margin and opportunity for growth and investment. Often times, families stuck in the cycle of disadvantage have never been given the tools or foundation needed to gain an asset. In order for neighborhoods to prosper, that cycle must be disrupted and we do this primarily through homeownership; the greatest wealth-producing asset available. Studies have shown that this has tremendous effect on a families social and economic well-being, and gives families and their communities an opportunity to grow. Homeownership also has profound individual and social benefit. High rates of homeownership in a community increases the tax base, improving the education system and attracting businesses, grocery stores, and financial institutions and investment to a neighborhood. Homeownership also creates stability for families—significantly increasing the rate at which children graduate high school and college.